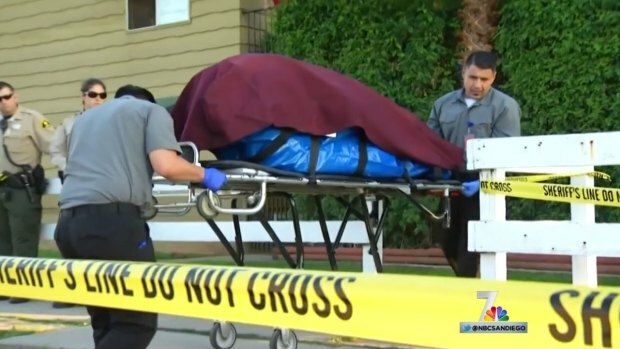 The body of a 28-year-old paraplegic woman found dead in her mother's San Diego-area apartment was wrapped in at least nine trash bags in a suitcase and weighed only 40 pounds, laying in a fetal position, according to an autopsy report obtained Wednesday by NBC7. The remains of Brooke MacBeth, 28, were found on March 3 in Lakeside. San Diego County Sheriff’s deputies arrived at Bonnie MacBeth's apartment to serve an eviction notice, according to a report from the Medical Examiner’s office obtained by NBC 7. Editor's Note: The details that follow from the newly obtained report may be disturbing to some readers. When deputies knocked on the door of the apartment on the 11600 block of Woodside Avenue, according to the report, Brooke’s mother Bonnie answered and told deputies she had something to show them. When they entered, they immediately noticed a foul odor. NBC 7's Steven Luke reports on why the woman's body found stuffed inside a suitcase in a Lakeside apartment is not considered the victim of homicide. “My daughter is dead in the bedroom,” she told deputies. When deputies walked into the bedroom but could not find the daughter, they asked where she was. “In a suitcase,” she told them, according to the report. Her mother reportedly told officials she had found her daughter dead in the bedroom. Under a pile of clothes and blankets, deputies found a black duffle bag with black duct tape around it. A deputy used his duty knife to cut into the duffle bag and found a second bag under it, which he also cut open. Under that second duffle bag sat a pink and brown suitcase with silver duct tape around the zipper. In that suitcase, they found a black trash bag. Under seven or eight layers of the trash bag, they found a purple towel or blanket. It was then officials contacted the medical examiner. In the blanket, the medical examiner found evidence of bones, including ribs. Brooke’s mother was taken to the hospital and placed on psychiatric hold, the report said. She reportedly told officials she tried to hang herself the evening before they arrived and had tried to commit suicide previously. She also told deputies she had been on a “vodka binge” for three days, the report said, because she knew someone would be coming to evict her. Her mother told them her daughter had died six months ago, 18 months ago and two years ago when questioned and told them she “felt guilty” since she passed. She was reportedly seen alive by her sister one year ago, who said she had been losing weight. Medical examiners said they later weighed her body and found it weighed 40 pounds. The autopsy report obtained by NBC 7 reported no evidence of trauma or obvious natural disease. Brooke may have died of natural causes, the autopsy report said, but found the cause and manner of her death undetermined. The medical examiner could also not arrive at an exact date of death, but determined based off the Sheriff’s investigation that Brooke was likely dead for several months before she was found. When officials called her younger sister, they learned she had last seen her before Christmas in 2014, when she appeared to have lost some weight, according to the report, and her sister believed it was from having difficulty eating. Her sister said she had been diagnosed with temporomandibular joint dysfunction. Macbeth, whose intellectual and physical disabilities prevented her from forming words, engaged the world through a variety of expressions, her former teachers said back in March.